Keeping track of unmanned aircraft systems in civil airspace is crucial. Unmanned aircraft systems (UAS), with their ability to provide persistent surveillance, have been game changers in Iraq and Afghanistan. To ensure force readiness, the military services need access to non-segregated civil airspace in the United States for training and development purposes. Civil airspace access is also important to conduct some operational missions and to support civil authorities during national emergencies. Other federal agencies, such as Customs and Border Protection and the U.S. Coast Guard, require access to civil airspace to perform their operational missions of patrolling U.S. borders and waters. In the future, commercial companies envision using UAS for a variety of purposes, such as fish spotting, agriculture monitoring and applications, and land management. All of these require that UAS routinely integrate with existing manned flights. A MITRE-sponsored research project, for example, is examining what happens if the command and control (C2) link from the pilot's ground control station to the UAS is disrupted. In such a "lost link" situation, the unmanned aircraft usually flies a pre-programmed contingency route based on its current state of flightaltitude, orientation, bearing. The absence of situational awareness and direct communication from the unmanned aircraft makes it difficult or impossible for the air traffic controllers to discover where the aircraft may be going and to clear traffic along its intended course. In addition to the FAA, many federal agencies such as the Department of Defense and the Department of Homeland Security have a stake in flying unmanned aircraft in civil airspace. "That's why MITRE is using an integrated approach that considers the perspectives of all of our sponsors," says Andrew Lacher, MITRE's UAS integration leader. "By the same token, we're using expertise across the company to develop solutions." Yet Lacher knows that a single project isn't a silver bullet for complete UAS integration. "There are many things we have to do," he says. "For example, when the UAS loses its communication link, there may be an impact on the air traffic controllers. We'll create a baseline to see how well new technology like the Intelligent Analyzer affects the controller workload and ATC operations." "In addition to the Intelligent Analyzer, we have a portfolio of projects that's supported by a clear research strategy. As we complete various projects, we'll publically demonstrate them, which we hope will stimulate the imaginations of aviation stakeholders and spark even more solutions." MITRE researchers may have one answer with their onboard Intelligent Analyzer, now in its prototype development phase. The research team includes co-principal investigators Qian Hu, chief scientist of speech technology in our Human Language Technology Department, and Chris Jella, senior principal multidiscipline systems engineer and former Global Hawk pilot. They are developing an onboard Intelligent Analyzer software prototype using MITRE-developed simulation software to emulate large unmanned aircraft such as the Predator and Global Hawk. 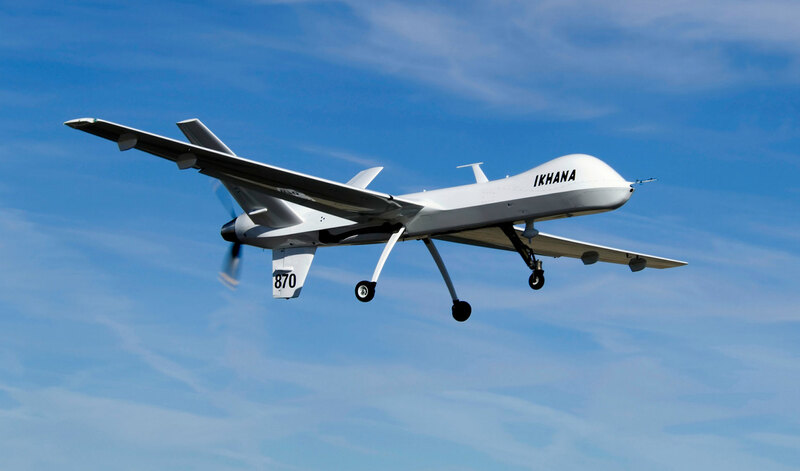 "The Intelligent Analyzer monitors the state of flight of the UAS," says Hu. "When the system detects the loss of a C2 link, the local air traffic controller and other nearby aircraft receive a synthesized voice broadcast over existing radio communications links." Here's how it works. Throughout a flight, the Intelligent Analyzer monitors the UAS's flight management system and constantly queries its current position, altitude, true airspeed, next waypoint, and remaining fuel mileage. As the mission plan proceeds, the system records the currently active segment (the intent). Newer segments erase older segments. This "intent data" converts to a text message that follows a standard protocol for reporting an aircraft's position. When the Intelligent Analyzer detects the absence of a C2 link, the system continues monitoring to see if the link is reestablished. If the C2 link interruption continues for a set amount of time, the Intelligent Analyzer determines that a lost C2 link situation exists. The Intelligent Analyzer then converts the text message with the intent data into a synthesized voice message. While the Intelligent Analyzer assembles the voice message, it monitors one of two international emergency voice frequencies to determine the right time to transmit the message. Most air traffic control towers, flight service stations, air route traffic control centers, many airline operations centers, and pilots flying in the area monitor these frequencies (121.5 MHz and 243.0 MHz). To test the Intelligent Analyzer, the team is using a MITRE simulation tool called Resources for Early and Agile Capability Testing, or REACT. The REACT tool can simulate various unmanned aircraft such as the Predator MQ-1 and the Global Hawk RQ-4. In addition to the original flight plan, REACT allows you to load various contingency plans and fly the mission plan at a variety of speeds. "To develop a simulation, we establish a data interface between the UAS's flight management system and the Intelligent Analyzer," says Hu. "This sends the data through a Web interface so that the Intelligent Analyzer can constantly monitor and query the UAS data as well as its contingency plan." The flight simulation is synchronized and visualized in Google Earth and FalconView, a PC-based mapping application developed by the Georgia Tech Research Institute for the Department of Defense. "We plan to continue developing and testing the Intelligent Analyzer in software simulations and then move to testing with UAS hardware for more realistic results," says Hu. "For instance, we are exploring integrating the Intelligent Analyzer on a test bed at the U.S Air Force Academy. We're also seeking to have broad collaboration and integration with UAS manufacturers. If the testing goes well, the Intelligent Analyzer may become an important factor in assuring the safe mix of UAS and civil aircraft in our nation's skies." When a command and control link of an unmanned aircraft system is lost, it continues flying but nobody knows where its going. Nearby aircraft could be in danger of a collision. A synthesized voice message sent over an emergency frequency could give the air traffic controller and nearby aircraft the latest flight direction of the UAS.